This sculpture, by renowned Utah artist Cyrus E. Dallin, is a tribute to the Wampanogas chief who greeted the Pilgrims at Plymouth Rock in Massachusetts. The statue was first erected at Plymouth, Massachusetts in 1921. 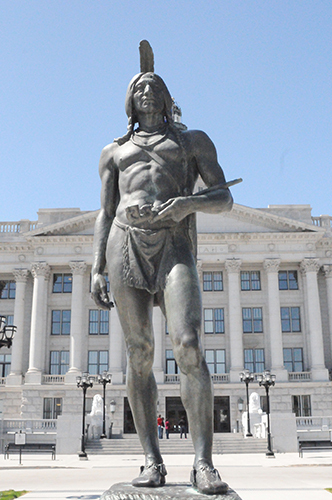 The original plaster figure was given to Utah by Dallin the next year and displayed in the Capitol rotunda. In 1927, The Nicholas Morgan Sr. Foundation funded the duplication of the statue in bronze. It was placed in the gardens in front of the Capitol in 1959. Now, the statue stands in front of the east doors of the Capitol. Another one of Dallin’s notable works is the sculpture of Angel Moroni atop the Salt Lake Temple located at Temple Square.